Often, people talk about not having the motivation get to the gym and workout. For some people, it can be the simple act of getting out of the house and getting yourself to the gym that is the hard part. For others, the fear of failure or self-doubt can cripple you and make it hard to want to workout. Still others have things they simply would rather be doing, such as going out with friends. No matter the reason, motivation can be hard to come by. This is especially true in the winter months when going home to curl up on the couch is more appealing than putting on shorts and getting active. When I feel my motivation lacking, I let quotes, whether it be from a successful athlete or someone else, inspire me. There are a lot of ways to utilize these quotes to your advantage and let them motivate you. Your favorite ones can be put on post-it notes around your home or office to remind you of why you began your fitness journey and to help motivate you to get to the gym. You could set one as the background of your phone or your computer to be a constant reminder. You can even use them as a personal mantra when you are trying to push out the last set in the gym. No matter how you use them, let these motivate you. There is a reason you go the gym, whether it be for health, weight loss, or something else. No matter what it is, when your motivation lessens, pump yourself back up. 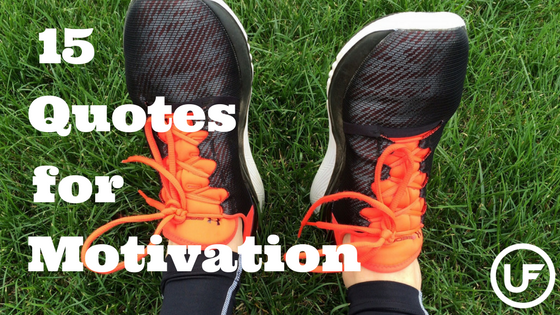 If you have another quote that fuels your motivation, share it with us in the comments below!